Nomeda and Gediminas Urbonas develop an interdisciplinary study where they investigate the role of political, cultural, and scientific imaginations as tools for social transformation and the discussion of public spaces. In 2014, they initiated the Zooetics project to explore new ways of connecting human knowledge to other life forms. This is what we see in Psychotropic House: Zooetics Pavilion of Ballardian Technologies (2015-2016): the installation draws inspiration from the short-stories found in "Vermilion Sands" (1971), a science fiction book by English author J. G. Ballard, which imagines a world where technological devices would be alive and sentient, such as a house capable of responding to the emotional states of its inhabitants. The work presented at the 32nd Bienal provides the concept of a future in which objects can not only be constructed but also cultivated by its human inhabitants and users – and vice versa. 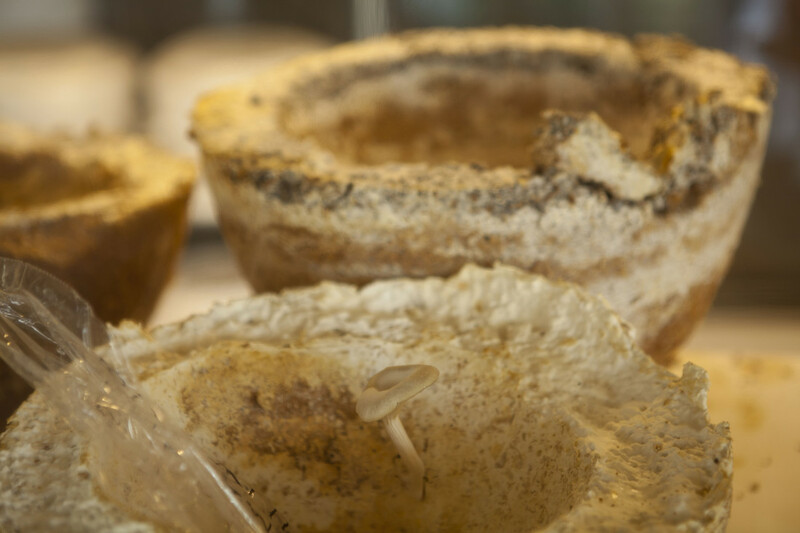 Using mycelium, the part of the fungus responsible for the absorption of nutrients, oxygen, and energy in a symbiotic relationship with other cultures and materials, participants can create their own biotechnological artifacts (mycomorphs), promoting mycelium’s interaction with coffe skin, sugar cane bagasse, corn pollard or eucalyptus saw dust.